I didn't believe it until I saw it. I figured it was just a few paint strokes here and there. Nope. 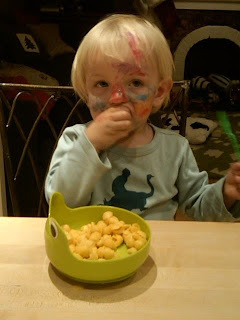 Maggie had crawled into Charlies crib while he was sleeping and painted his face. His WHOLE face. Every single color of the rainbow in her nail polish set. And the BEST part - she painted a pink stripe in his hair so that he could be just like her. I thought the whole thing was HILARIOUS.